This step-by-step guide shows how you can configure an E-mail User, so it can forward incoming emails as SMS messages. The recipient's phone numbers can configured for the user or it can be specified in the subject line of the received email. The E-mail User periodically downloads emails through a POP3 connection from an email account. It creates an SMS of the first 160 characters of the email's body and sends it to the recipient (Figure 1). Please install E-mail User by using Ozeki SMS Gateway's browser GUI. After you have selected a unique username, you will find yourself on the 'E-mail to SMS' tabpage of the 'Configuration' panel. This tabpage consists of 4 sub-tabpages: 'POP3 server', 'Recipient Settings', 'Filter e-mail messages' plus 'Advanced'. You will find all 4 described later on. First you should connect to your email account on the POP3 server (Figure 2). Ozeki SMS Gateway's E-mail User should be connected to the POP3 account, so it can periodically download the emails and forward them to mobile phones. POP3 Server, Port, SSL: The IP address, port number of the POP3 server. You can also turn on SSL by clicking on the checkbox. You can search the connection details on the internet for the most popular email providers. POP3 Username: The username of the email account. This can be your email box. POP3 Password: The password belonging to the username. Download interval: New emails are periodically downloaded from the POP3 account. It is the time period in sec. 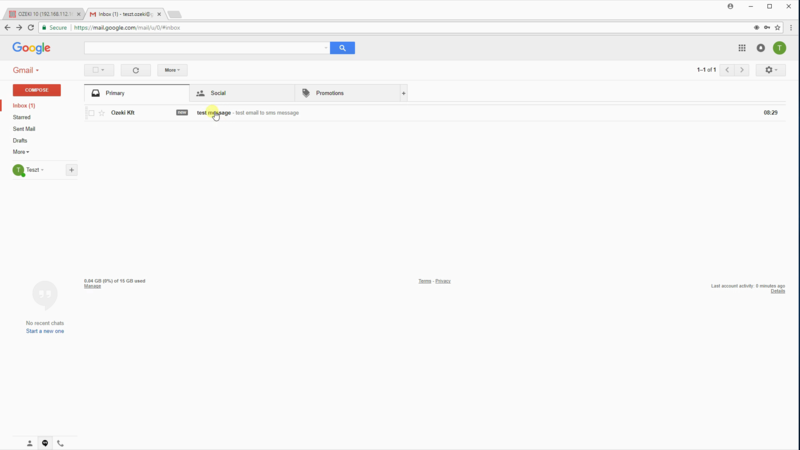 The 'Filter email messages' tabpage is really useful for filtering the downloaded emails. Only filtered emails are going to be forwarded via SMS. The filter can save you a large amount of money, since it keeps your spams from being forwarded as SMS messages. It is strongly advised to specify the sender and receiver addresses and select which keywords should occur in the subject line (Figure 4) Multiple addresses and keywords should be separated by semicolons. If you would like to set another email filter, you should install another E-mail User. There is no maximum number of E-mail users you can install. Send e-mail to sender if SMS was delivered to network. Send e-mail to sender if SMS was delivered to handset. Send e-mail to sender if SMS was not delivered because of an error. The maximum SMS length specifies how many characters should be used from the beginning of the email. More than one SMS will be sent if you specify a larger character number than 160. In this case the content will be splitted in multiple SMS messages. The messages will be concatenated at the destination. These messages can contain a maximum of 153 characters before concatenation. The other 7 characters stores concatenation information. 160 is the default number for maximum SMS length. Include the sender e-mail address in the SMS. Set originator address to the sender's e-mail address.